The most generous emergency aid donor in 2016 was Norway. Norwegian taxpayers provided $899 million in humanitarian spending, about 0.18% of their national income. Luxembourg and the United Arab Emirates took second and third place by the same yardstick. Last year, the top ranking went to Kuwait. Overall, some $22 billion of humanitarian spending was tracked in 2016, up from $20.9 billion in 2015, but not as high as the $23.5 billion reported in 2014. Emergency aid in 2015 formed about 16 percent of $131.6 billion in total international aid spending, according to the OECD, which tracks the largest donors. Norwegians may be the most generous relative to their national wealth. However, the largest single donor is the US, offering more than $6 billion in emergency aid. Given the size of its economy, it falls only in 16th place, behind minnows such as Finland, in terms of relative generosity. And which aid organisations picked up the most funding in the year? 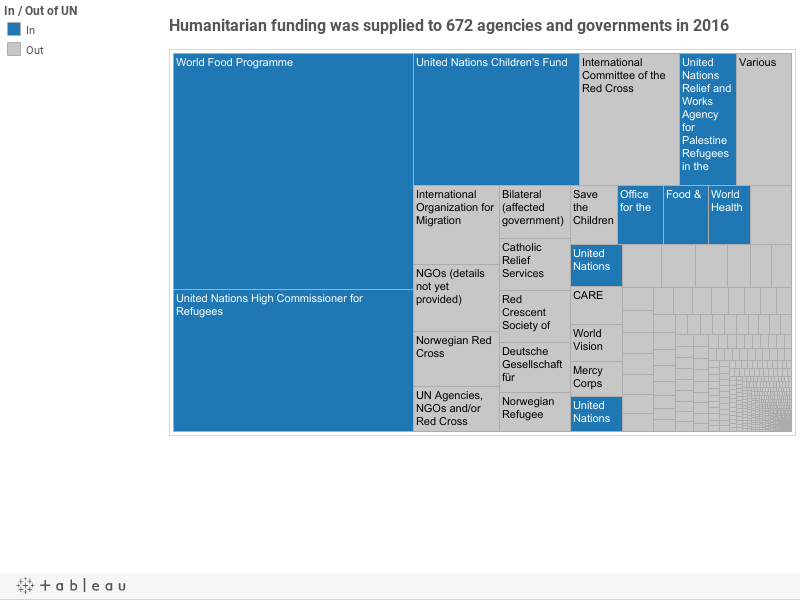 UN agencies took 60% of the reported funding, while the Red Cross Movement picked up 10 percent, about $2.2 billion. The FTS data depends on voluntary reporting and does not capture some financial flows. The database reports $4.3 billion in funding for NGOs, but as NGOs rarely report their income from the public, this is likely to be a low estimate. The annual funding survey, Global Humanitarian Assistance, tracks five to six billion more dollars of charitable and corporate giving towards humanitarian causes, mainly spent through non-UN channels. Size matters to Europe. Its own website declares that “collectively, the EU and its constituent countries are the world's leading donor of humanitarian aid.” We checked the claim. If we add the funding from EU member states directly, as well as the funds routed through the EU institutions, as well as contributions to the Central Emergency Response Fund, the contribution from “political Europe” comes to more than $9.9 billion – indeed nearly half (47 percent) of the world’s total. We also allocated $324 million of funding for the UN’s pooled fund, the CERF, to its original European donors. These figures exclude Norway, Switzerland, and other non-members of the EU. Only EU member state Croatia reported nil humanitarian funding to the UN in 2016. However, the other members contributed $6.8 billion. 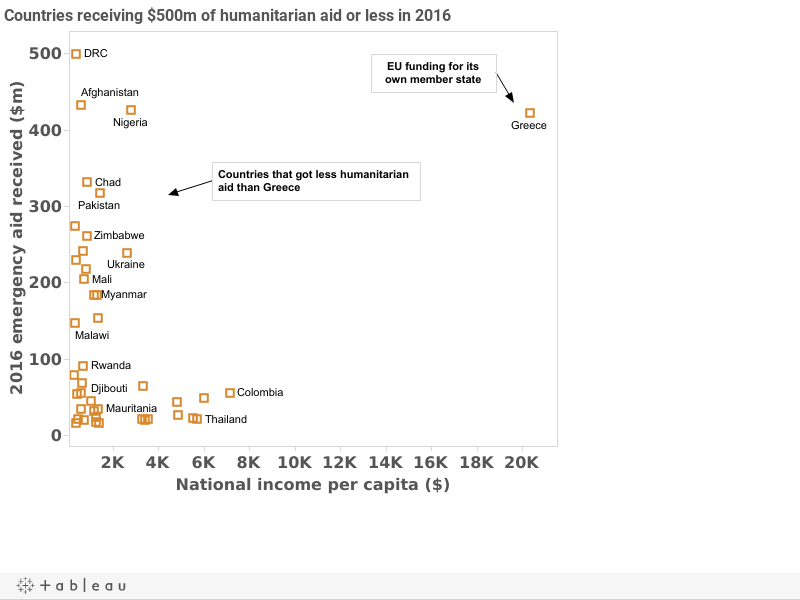 But here’s the thing: Europe is now “aiding” itself: with a tally of $422 million, Greece has received more “humanitarian aid” than Central African Republic. The EU expanded its definition of humanitarian aid to include situations within its borders, and decided to spend $328 million on Greece. And so ends another strange year in humanitarian economics.